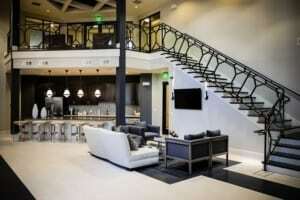 During recent years, the staircase market has experienced a surge of growth for modern staircases. Modern style staircases bring many different options for railings, risers, and even the kind of balusters that are used. 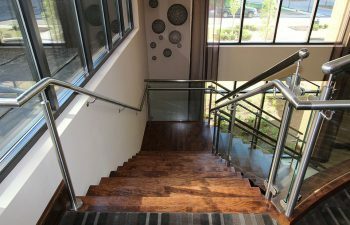 Stainless steel and glass staircases have become one of the most popular options for those seeking a modern staircase, and it is not hard to see why. Versatile and beautiful, the combination of stainless steel and glass can be used to create a stunning look for any staircase. In this week’s blog, we take a look at some examples of projects that have blended stainless steel with a glass staircase and how it makes a statement. Our first featured staircase is a straight stair that utilizes a stainless steel and glass handrail system. The stainless steel handrail and glass enhance the straight wood staircase and create a modern style. Our next featured staircase is unique because the stainless steel handrail, combined with the distressed glass, create a look that will capture the attention of anyone who walks in the home. Our third featured staircase is an amazing triple threat: this stair utilizes a combination of stainless steel, glass, and wrought iron. Our final featured staircase shows that stainless steel and glass can be used with any kind of staircase, even an open riser like the one shown below. This glass staircase nicely compliments the home’s modern interior with the open risers, stainless steel, and glass. 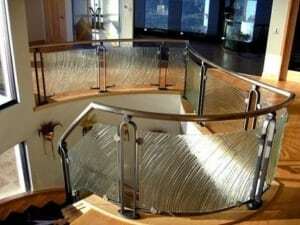 Check out our modern, stainless steel, and glass staircase gallery for additional product photos and details. From inspiration to installation our team is committed to designing and building the highest quality staircase for your needs. Our reputation speaks for itself, and client satisfaction is our highest priority. Contact us today to get started on your staircase project.